Following two days of location tours round London, the Time Quest 2 weekend finally gets underway. The weekends events kicked off with a two-handed stage talk with Janet Fielding and Paul McGann (see right) - not the most obvious pairing, but more on that soon. Saldy Paul was stuck on traffic on the M25, so Janet was left to talk on her own for a while, and to struggle opening a bottle of mineral water whilst holding her mic AND talking! She turns out to be quite a wit and more than capable of holding her own. The door at the side then opened and a hesitant McGann appeared, man-bag in hand. He sat down and hit the ground running with stories and annecdotes about his time as The Doctor and his career in general. What soon transpired was that after giving up acting, Janet had become an agent and had Paul on her books when the casting call for Who came in. Her advise? Don’t take it! When he did get it she went to Vancouver for the filming and had a ball! 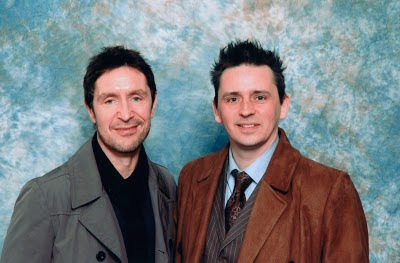 Next on the agenda was a photocall with Paul McGann (see above - why is it HE looks like the nerdy convention goer and not me?). Having never attended these events it is all new to me, so I had no idea how they run these things. The queue was loooonnnng and I wondered how they’d get through every one, but it’s a military operation and they put you in with the star - shot taken - check camera - next! And you’re out. Most impressive!! So from that queue it was straight onto the next one for the Tom Baker signing. Tom was signing in a room to himself, though the others shared a room elsewhere. This queue was equally, if not longer - and running at a fraction of the speed. We slowly moved forward, but it was painful with every step. As we approached the room and could see in we found the queue then snaked three times like the inexerable approach to the front of a post office counter - and believe me, posting the number of Seven Hankies I sold recently, I’ve been in more than my share of those. At the same time, in the other room, Peter Davison was signing, and since I am on a minor mission to get all five Doctors, I could not miss that. A quick work with a steward confirmed I needed to dip out of this queue, get my Davison autograph, and return, my place having been held for me. While getting my Davison sig, I took advantage of the chance to ask him about the trousers he wore. I reminded him of the high-backed trousers with braces in Planet Of Fire, which he just about brought to the front of his mind. I then asked if the earlier version was also high-backed with button braces, which he confirmed they definately were. This was something I had wanted to find out for a long time. Back in the Tom Baker queue, things had hardly moved forward, so no time wasted there. I took advantage of the time standing in line to start writing the entry you are reading! Meeting Tom again was fun. He’s well known for being mad as a box of frogs, and he never fails to deliver. The first time I met him was around 1976, when he came to a local bookshop where I lived in Edgware, North West London. He was totally MY Doctor and my idol at the time, so I could not wait to meet him. Now, my name is spelt s-t-e-v-e-n, which is the US spelling, having been named after Steve McQueen, who was very popular in 1966. With the UK spelling being StePHen, I used to get very annoyed when it was spelt wrong. So when asked ‘Who was this for?’ I replied ‘To Steven with a V’. 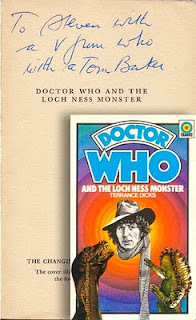 Tom then signed my Terror Of The Zygons Target novel (my fav story at the time) ‘To Steven with a V from Who with a Tom Baker’! Next up I opted for the Janet Fielding photocall over the Sian Pattenden/Lucy Benjamin stage talk. Who are they I here you say? They were the two childen used as the young Tegan and Nyssa respectively in Mawdryn Undead. A no-brainer choice, sorry, but since I had paid extra for a gold ticket, I did my photocalls with them right after. It was around this time that I discovered a tiny room off the main reception where someone was holding a cosplay discussion and open forum. 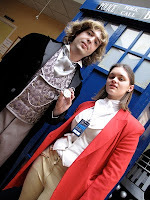 This obviously caught my eye – but what I wasn’t prepared for was it being Johanna Mead, who founded and moderates the dw_cosplay forum, on which I have regularly posted! I have always admired her for having the get-up-and-go to run such a group, and the vision to keep it on track and the pleasant place it is to discuss and exchange views without fear of being shouted down or ridiculed. Not as easy a task as you might think! It was great to chat to her, especially about her meeting Louise Page (our heroine) at the recent Gallifrey One event. Joanne was wearing a natty little FemmeTen outfit, consisting of a short jacket (inspired by the coat) and a long brown dress which had a fine blue pinstripe. The outfit was rounded off by some unique high heals, in a converse style! Inspired! After lunch it was the first group photocall with all the days available guests (see below). What you can’t quite see in the photo is that Tom was carrying a shopping bag in his left hand – as if he was only passing through! 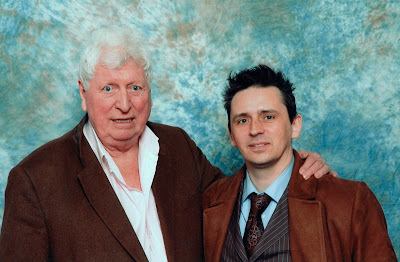 Thank heavens these queues are mercefully quick moving, cos right after that it was time to photocall with Tom Baker on his own (see below). After two photo calls Tom then took to the stage and gave a very colourful and entertaining talk. He just rambled on about anything and everything, a highlight of which was a story of him kissing the jugular of over 100 sweaty women at a convention in America. You had to be there I think! 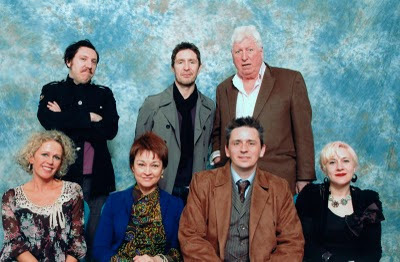 I then spent the rest of the afteroon getting signatures from Paul McGann, and the three ladies, Janet, Sian and Lucy. I rounded off my day by ducking back into the stage talk, this time with the crew form Big Finish. It was interesting hearing their spin on what they do and how they making things happen. The main panelist was Nicholas Briggs, who as we all know provides the voices for the new series Daleks and Cybermen. I did get up to one last thing, but more of that in a later posting in the Tennant Coat blog . . . . it’s worth waiting for! All in all it was a great first day – I thoroughly enjoyed myself and met up with some online friends I had not met face-to-face before. 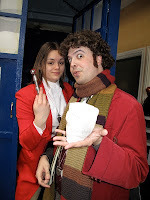 In picture day one 48 that's Hannah Wollaston and Matt Chambers from numerous Doctor Who fan vids sduch as those by Trinity Productions and Anermay isn't it? My mind almost exploded, it's like seeing two of your favourite tv series cross paths, however subtly.